Personally, I do the best that I can to get the cheapest price that I can on just about anything. This includes most of the household cleaners that I use. For some, I have actually stopped using them altogether and gone to making my own while with others I use a generic cheaper alternative. However, it recently occurred to me that the savings shouldn’t stop there. I realized that it doesn’t make sense to get a great deal on any particular household cleaner and then proceed to waste it when it comes to actually using it. What comes to mind for me in particular is laundry detergent, dish detergent, and my liquid soap for pots and pans. I am sure you realize that the little cup that serves as the cap for your laundry detergent is there for a reason. It is a measuring cup. If you don’t already, you should try using it. Laundry detergent is actually a very good example because in my estimation, laundry detergent is expensive. And in my household, we only do about 1-2 loads of wash per week. So I know the expense is even higher for larger families that do multiple loads. A recent survey showed that as many as 53% of American households use more than directed or even worse, don’t measure at all. Find out where that little line is on the cup and use it (keep in mind this “line” can vary greatly depending on the detergent you’re using). I’ve also learned that with high efficiency washers, your clothes can come out smelling worse or feeling soapy if you use TOO much detergent. In many circumstances, you can even get away with using less than directed. Think about it. The people in charge of making the measuring cups for your laundry detergent or the openings on the containers of dish detergent or liquid soap are also the people that are trying to sell more of their product. Don’t you think it would be in their best interests to see you use as much of their product as you possibly can? I can tell you what I do. For my dishwasher, I fill up the cup about halfway. You really have to be careful because the opening of some packages is so wide that much more will come out than you actually need. My dishes come out just as clean as they did when I was filling the cup up all the way. The same strategy should go for laundry, especially if you have a high efficiency washer. Recently, purely by accident, I came up with a little trick that solved the issue for my liquid dish detergent. We try not to run our dishwasher very often (a great money-saving strategy) so we probably use our liquid dish detergent much more during each use than our machine detergent. One day, I opened up a new bottle of it and the little hole to dispense the product just didn’t open when I removed the plastic top. So, I got a little pin and just made a little pin prick on the top of the bottle. Now, only a tiny amount can fit out of the pin prick, probably about 25% of what would come out if I had opened the bottle normally. Guess what? My pots and pans still come out just as clean and I can stretch a bottle of that stuff out about four times longer than I used to. How can you tell if you are using too much laundry detergent? I found a simple test. Take some bath towels and put them in your washer without any detergent. Use four to six towels for a front-loading machine and just one for a top loader. Set your machine to hot water and on medium wash and run it for about five minutes. Check for soap suds. If you don’t see any, turn the machine off and see if there is any soap residue in your machine. If there is, it is soap coming out of your clothes from your last wash. You may find that you have to do this test multiple times before you can run it without see any soap residue at all. Obviously, if this is the case, then you’re using too much soap. One other good little tip is to use just enough detergent in your loads so that the water is just beginning to bubble when the washing cycle begins. Too many bubbles and you’ve already gone overboard. After a few loads, you’ll get a hang of what your laundry really requires. 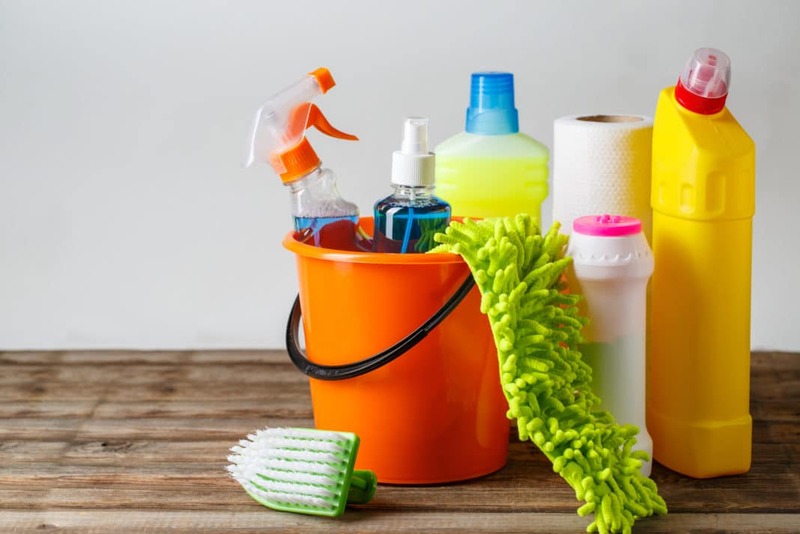 If you are frugal like me and do the best you can to save money while buying your home cleaning products, do yourself a favor and put the same frugality into practice when it comes to using them. First off, make sure you are only using the directed amounts, and then on top of that you can probably even cut back from that amount as well. You are only using a little bit at a time, but you are using these items over and over again, so overusing them can really put a dent in the savings you thought you got at the grocery store. It’s better for the environment as well to use less. Do you have any tricks to guard against overusing household cleaners? Share with our readers below.